So, my last attempt at a fully integrated power controller was a smouldering failure. Q7 decided it wasn’t happy about where things were going, and let the world know by the only way it knew: smoke signals! Curiously, only one of the MOSFETs in use seems to be damaged. 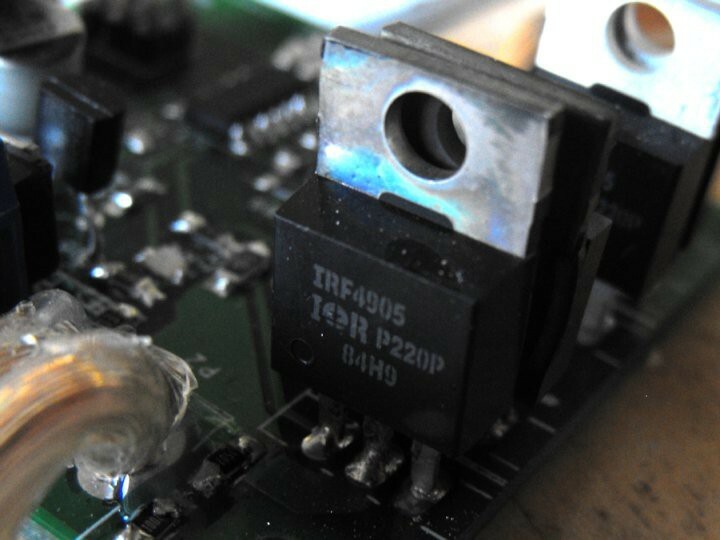 When we look at its mate on the other side, Q2, sure it’s discoloured, which could be indication that it has been stressed, or maybe it just got burned by the other MOSFET. It goes without saying that the pair in the background are fine: no current flowed through them during this test. This got me thinking, did it get too hot, or did something else go wrong? 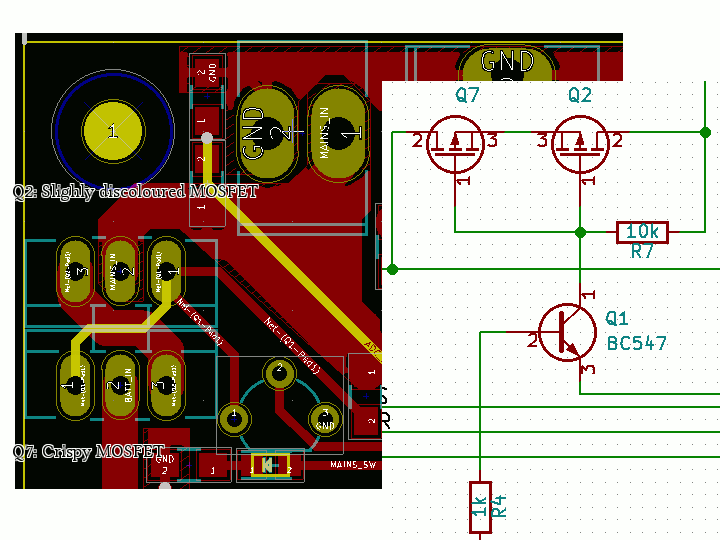 This is the schematic and PCB layout of that part of the board. Now looking at it, one thing strikes me. Seems I might have the source pins connected back-to-back, not the drain pins. Could that be it? I think I intended it the other way but didn’t pay enough attention to the schematic symbol. 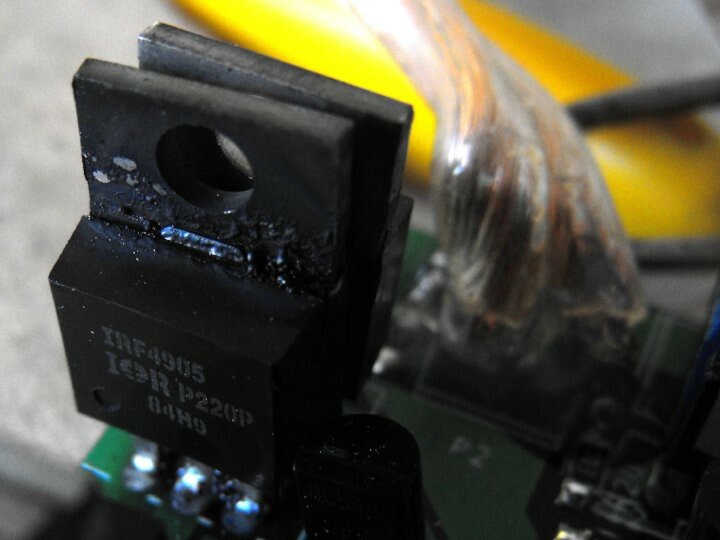 This could be a factor, or maybe the other MOSFET might’ve blown instead. One thing is certain, I cannot join the two tabs together to the same heat-sink like I was intending with this schematic. Mia culpa! Thinking about the design, the idea of putting the MOSFETs might be a tad naïve, as by far they are going to be the most likely component to fail on the board. The concept of a separate power module would work better since it’s easy then to just rip one out and put another in its place. 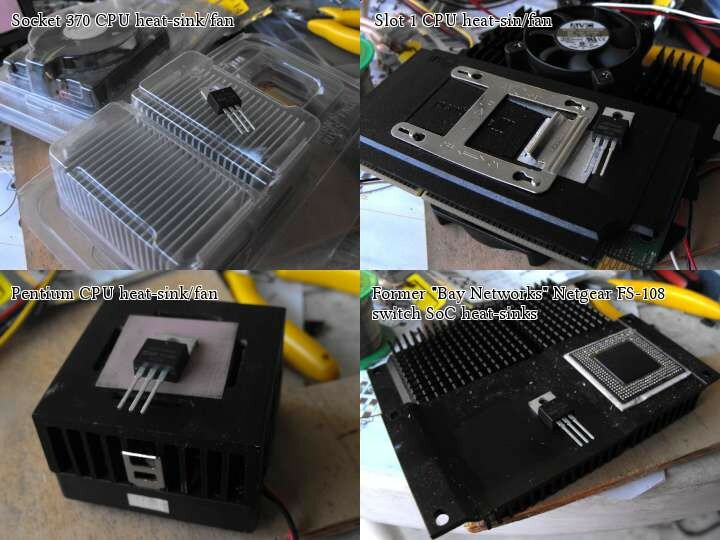 Designed right, this could even be hot-pluggable, and can incorporate a heat-sink, and can make use of larger or smaller MOSFETs for different applications. Luckily, the existing board layout will accommodate this just fine. We put 3-pin KK connectors in place of Q2 and Q4, and we can jumper across Q7 and Q8. 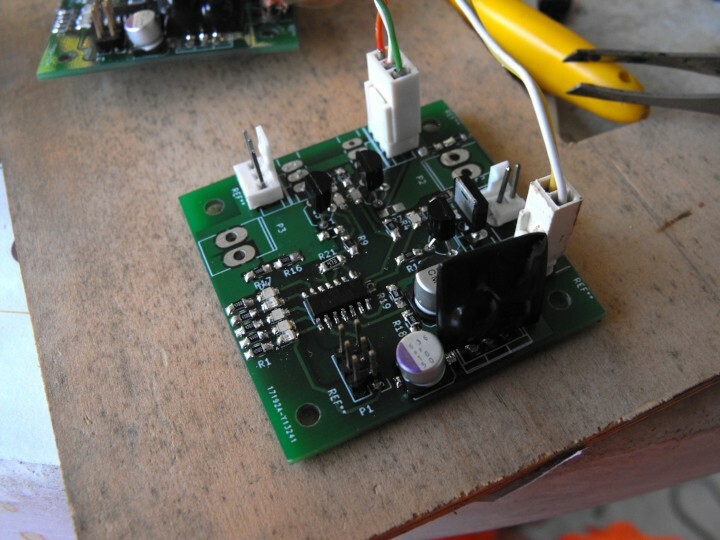 This means the feed to the battery only needs to be a light-gauge wire, sufficient to power the controller and measure the battery voltage. The pin-out isn’t ideal for this: it would be better to have a pin connecting to 0V instead of the battery +12V, but it’s workable. The gate pin becomes an open-collector output, and can theoretically drive (low-current) relays or MOSFETs. All of these dwarf the TO-220 package transistor I’m using… okay the one shown is an IRF-9540, but it’s still a TO-220 put there for scale reference. Most of these are for Intel CPUs that are long obsolete, and the top right has the CPUs in question still firmly attached. The Pentium CPU heat-sink/fan would be the closest in the size, I was hoping I might’ve had a 486 heat-sink laying around, I’m of the opinion that if the power module needs a fan on any of these heat sinks, I’m doing it wrong. This might not be the case if I wanted the full 70A capability, but I’m pushing for 30 which is less than 50% capacity. The only passive ones I have, and happen to have multiple of, are the ones on the lower right, which were extracted from dead Netgear (Bay Networks) switches. The BGA package still stuck to one of them is a Broadcom BCM5308A2KTB Ethernet switch SoC… it talked to a couple of SRAM packages (duly harvested) and a number of Ethernet PHYs. A connector of some sort, either a PCB edge connector, or perhaps a specially keyed Andersen Power Pole connector pairs (which can be rotated 90°) could connect power and control in one secure mounting. Two 30A connectors and a 15A would serve this job well, and they come in a range of colours for the housings. Thus I can avoid the red/black typical colouring to avoid confusion.